Scythia - the area north of Moesia and eastwards along the norther shore of the Black-Sea - was home to numerous Greek colonies and other coin-producing settlements. It includes the regions of Taurica and Sarmatia. 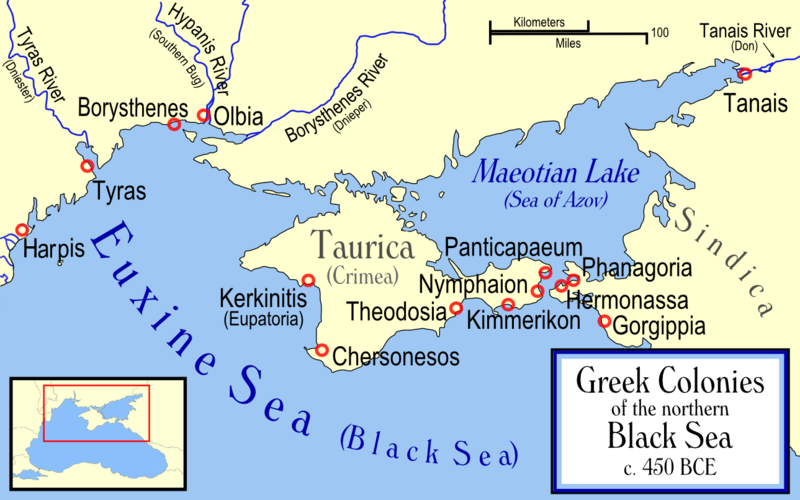 The chief Greek settlements in the area were Harpis, Tyras, Borysthenes, Olbia, Kerkinitis, Tauric Chersonesos, Theodosia, Nymphaion, Kimmerikon, Panticapaeum, Hermonassa, Phanagoria, Gorgippia, and Tanais. Reverse: Forepart of griffin left; below, sturgeon left.